Say goodbye to your normal PCP fill source! 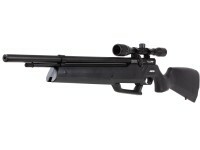 The Seneca Aspen PCP Air Rifle is a multi-pump PCP airgun that has everything built right in. Shoot for hours--free from air tanks, compressors, and handpumps. How many shots per tank fill out of this gun in the .25 caliber? Fill it once and then pump it up 3-4 times every shot or every other shot and you will not have to really worry about how many shots you will get.